Introducing a business opportunity built on inherent year-round demand. For more than 50 years, ServiceMaster Restore ® has provided emergency property and content restoration for residential and commercial losses due to water, fire, or smoke damage. We’re available 24/7/365 and can begin emergency services just hours after the initial call. At ServiceMaster Restore, our franchisees are business-minded individuals with strong management skills and outstanding customer service who enjoy working with people. They take great pride in managing a team that provides expert emergency property restoration for residential and commercial losses due to water, fire, or smoke damage. ServiceMaster Restore offers some of the most comprehensive training in the industry by combining classroom instruction, in-field inspections, and hands-on technical training with tools like flood houses. Joining a network of ServiceMaster Restore franchisees means having access to a wealth of knowledge whenever you need it. Our franchisees share best practices and strategies that continually strengthen our brand across North America. With a dedicated marketing specialist, online support, and digital strategies working for you around the clock, every opportunity to help you with your business will be at your fingertips. ServiceMaster Restore is a ServiceMaster ® company. 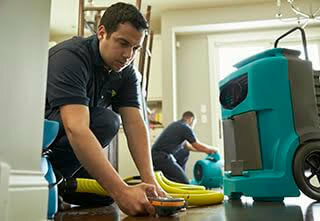 ServiceMaster encompasses several highly recognized brands and has 65 years of franchise experience. Through our affiliate, the ServiceMaster Acceptance Company (SMAC), we can finance up to 80% of the initial franchise fee, equipment costs, and supply costs to help you start your business. ServiceMaster Restore has over 50 years of experience and there are more than 4,300 ServiceMaster Restore and ServiceMaster Clean locations around the world. Being a leading brand in both the residential and commercial space means incredible opportunity for franchisees to capture numerous revenue streams. We provide residential and commercial clients with flood damage restoration, mold remediation, fire damage restoration, smoke and soot repair, and post-loss reconstruction. Our unique 866 RECOVER service provides commercial clients with emergency disaster recovery help in just 2 to 4 hours. Whether your clients operate a single retail store, a national chain of luxury hotels, millions of square feet in warehouse space, or a few local offices, ServiceMaster Restore has the experience and resources to handle any situation from regional flood waters and acts of terrorism to broken pipes and dumpster fires. 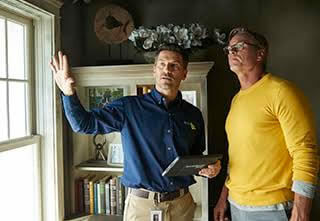 Our parent company, The ServiceMaster Company, has been helping people like you start businesses since 1952. There’s never been a better time to join the team. The franchise sales information in this communication does not constitute an offer to sell a franchise. The offer of a franchise can only be made through the delivery of a Franchise Disclosure Document. Certain states require that we register the franchise disclosure document in those states before offering and selling a franchise in that jurisdiction. NY NOTE: This Advertisement is not an offering. An offering can only be made by a prospectus filed first with the Department of Law of the State of New York. Such filing does not constitute approval by the Department of Law. Moreover, we will not offer or sell franchises in those states until we have registered the franchise (or obtained an applicable exemption from registration) and delivered the franchise disclosure document to the prospective franchisee in compliance with law. ServiceMaster Residential/Commercial Services L.P. Minnesota File No. F7462. ServiceMaster Residential/Commercial Services L.P., 150 Peabody Pl, SMC-7000, Memphis, TN 38103-3720.
Financing is available through ServiceMaster Acceptance Company, a subsidiary of The ServiceMaster Co. L.L.C., to credit qualified individuals. © 2018 ServiceMaster Residential/Commercial Services L.P. All rights reserved. ServiceMaster Restore is currently accepting inquiries from the following states: Alabama, Alaska, Arizona, Arkansas, California, Colorado, Connecticut, Delaware, Florida, Georgia, Hawaii, Idaho, Illinois, Indiana, Iowa, Kansas, Kentucky, Louisiana, Maine, Maryland, Massachusetts, Michigan, Minnesota, Mississippi, Missouri, Montana, Nebraska, Nevada, New Hampshire, New Jersey, New Mexico, New York, North Carolina, North Dakota, Ohio, Oklahoma, Oregon, Pennsylvania, Rhode Island, South Carolina, South Dakota, Tennessee, Texas, Utah, Vermont, Virginia, Washington, Washington, D.C., West Virginia, Wisconsin, Wyoming.